I set out to make vegetable beef soup last week, but in my search through the freezer for ingredients I noticed a package of beef stew meat. Since I’m trying to use up my freezer stash, I decided on beef stew instead of the soup. If you’ve never made stew before, you’ll be happy to know it’s easy and very forgiving. Use the recipe as a starting point, but add and subtract ingredients to suit yourself. If you like root vegetables, chop and add some more. Mushrooms would probably be good in this as well, if you’re a mushroom person. I adapted the recipe from a slow-cooker recipe. I’ve never liked slow cooker recipes that require browning the meat first. I’m lazy and don’t like cleaning that extra pan. 🙂 I have a 7 qt. dutch oven I absolutely love. And when I say I LOVE it, I’m not exaggerating. It’s my go-to for soups, chili, pot roasts, etc. I can use it on the stove top or in the oven. Or, as in this case, I can brown the beef on the stove and finish the dish in the oven. No need for the crock pot, and only 1 dish to clean! If you want to use your slow cooker, please do so. Just follow the first few steps and instead of putting the pot in the oven, transfer the mixture to your slow cooker and turn it on low for 4-6 hours. So back to this beef stew. I know it’s turkey season, but you only need so many turkey dishes, right? Beef stew makes a great change of flavor from the traditional holiday meals, and with the weather cooling off, it’s a welcome dish. If you have leftovers, they’re great to pack up for lunch at the office. This stew is rich and flavorful, a nice hearty meal if you serve it with a salad and warm rolls. It was everything I was hoping it would be! Tender beef, tasty carrots, potatoes and celery in a broth that thickens as it cooks. Try this and let me know what you think! If using the oven method, preheat your oven to 350 degrees. Mix together the flour, seasoned salt and pepper. Heat 1 T cooking oil in your dutch oven (or skillet if using crock pot method). When browned, transfer meat to bowl and set aside and repeat with another 1/3 of the oil and beef until all beef is browned. Add 1 T oil if needed and drop the garlic and onions in the oil. Let them sizzle about 30 seconds then stir. 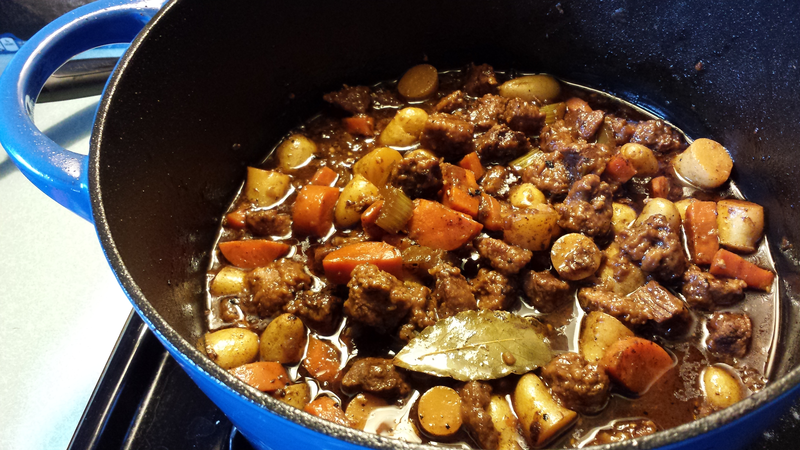 If continuing to use the dutch oven, stir in 1 cup beef broth. Scrape the bottom of the pan to loosen the pieces. Add the remaining broth, browned beef, and remaining ingredients. Cover the pan and put it in the oven. Bake for 2 1/2 hours. Be careful when you take the lid off – steam is HOT! !